Locro is a hearty thick stew popular along the Andes mountain range in South America. This variation of locro is traditional from Arequipa, in the Southern region of Peru. 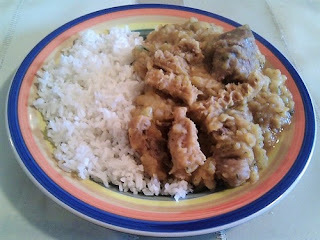 Put the water in a pot, add two teaspoons of salt, the daikon, celery, leek, cilantro, beef and tripe. Cook on medium-high until the meat and tripe are tender. Strain the broth and reserve. In another pot heat the oil and fry the onion until translucent. Add the garlic, aji panca, black pepper, cumin and one teaspoon of salt. Cook for two minutes, stirring and mixing all the ingredients well. Add the broth and potatoes. Set heat to medium and cook until potatoes are tender. With a potato masher, gently press down the potatoes until they slightly mash. Add the beef and tripe, add more salt if needed, and mix well. If the mix is too thick add a little bit of hot broth. Serve with white rice and sprinkle it with chopped cilantro.